Curry leaves, or kadi patta as they are more commonly known, are used in many Indian dishes. The aroma and flavour they add to food is tantalising. They grow on a tree called curry tree (Murraya koenigii), with a featherlike formation of 11 to 20 leaves on a stalk. Their medicinal properties are many. Curry leaves have a high level of iron, and folic acid that helps in the absorption of iron. Therefore curry leaves are beneficial for warding off anaemia. Due to the antioxidant property of kaempferol, a flavonoid present in curry leaves, they may be beneficial in protecting the liver from extensive damage. 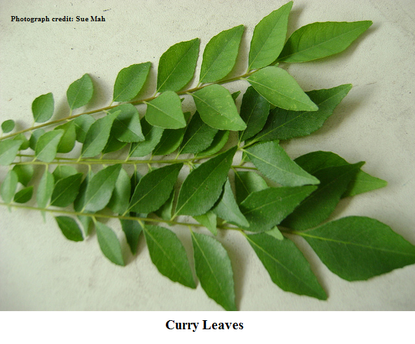 Insulin sensitivity can be increased by eating curry leaves, thus reducing blood sugar levels. The high amount of antioxidants in curry leaves help increase the good cholesterol and prevent heart disease and arteriosclerosis. There is some evidence that certain alkaloids present in curry leaves may be a safeguard against leukaemia. Pregnant women who eat curry leaves will find that it reduces morning sickness. Eating curry leaves is good for digestion and can even stop diarrhoea. Its antimicrobial property makes it a good remedy for skin eruptions, where a poultice of the leaves can be applied. Ingredients: 1/4 Kg beef mince, 1 tbsp of ginger garlic paste, 4 large onions, 2 green chillies, 1 tbsp of vinegar, 2 tbsp of wheat flour, 2 eggs, 2 tbsp of cooking oil,1 tsp sugar and salt to taste. Preparation: Finely chop the onions and the chillies. Whisk the two eggs. Mix the beef mince, ginger garlic paste, vinegar, onions, chillies, wheat flour, whisked eggs, sugar and salt to make an even mixture. Make small balls of the mixture in the hollow of your hand and pat them to form a patty. Fry these for two minutes on a high flame, turning them both sides. Then reduce the flame to the lowest and shallow fry for about 7 minutes on each side. Ingredients: 2 bunches of palak (spinach), 250 grams of frozen paneer (fresh paneer will require frying separately to prevent it from disintegrating in the dish), two medium size onions, 2 green chillies, ½ tsp of red chilli powder, ¼ tsp of turmeric, ¼ tsp of dry mango powder, ¼ tsp cumin seeds and salt to taste. Preparation: Chop the spinach roughly, including the stalks. Boil in water for 1 minute on high flame. Then drain it to get rid of the oxalic acid. This makes the spinach less bitter. Chop the onions finely and sauté them till they are translucent. Add the cumin, whole green chillies (which have a tiny slit in them), red chilli powder, turmeric, and dry mango powder. Cook this mixture for a minute and add the paneer. Mix well and cook for a minute, stirring now and then. Then add the palak and salt and cook for about 25 minutes. Add a little water if necessary. For dandruff due to an oily scalp or fungal infection, boil a handful of neem leaves in 500 ml of water and wash your scalp with it. Do this about 2 to 3 times a week. A good remedy for dandruff as a result of a dry scalp is a small bowl full of coconut oil with the juice of half a lime. This should be applied to the scalp and left in for half an hour and then washed out. This procedure should be carried out 2 to 3 times a week.